Congratulations to Ryan Donnelly, this year’s lucky winner of the NIIMC prize draw for a TAG Heuer Connected watch. 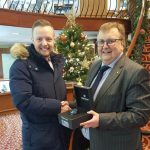 Ryan bought his entry for the draw at our annual show in May and was delighted to take a call from Club Secretary Tim Logan a few weeks ago to confirm that his ticket had been picked during the grand draw at our annual dinner on 8 December at Lisburn Golf Club. 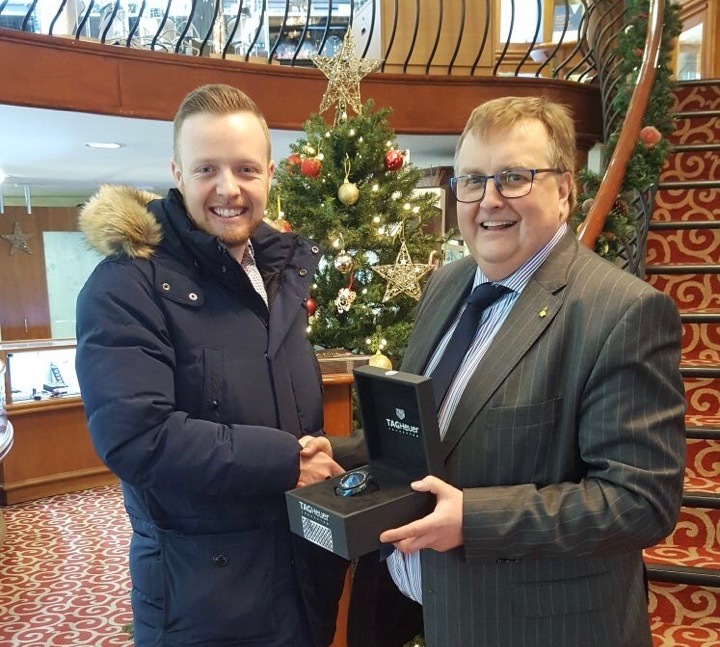 Ryan is pictured receiving his watch from Mervyn Shannon from Shannon’s Jewellers during the week. Our thanks to Mervyn once again for his unstinting support and generosity to the club throughout the year. With Christmas almost upon us it is also the ideal time to extend our thanks to club members, our families, friends, Donnelly Group and a host of other people (too many to mention by name) who have supported us throughout the year. Everyone has earned their Christmas and New Year break and on behalf of the Club I’d like to extend our very best wishes to everyone and their loved ones at this special time of year.